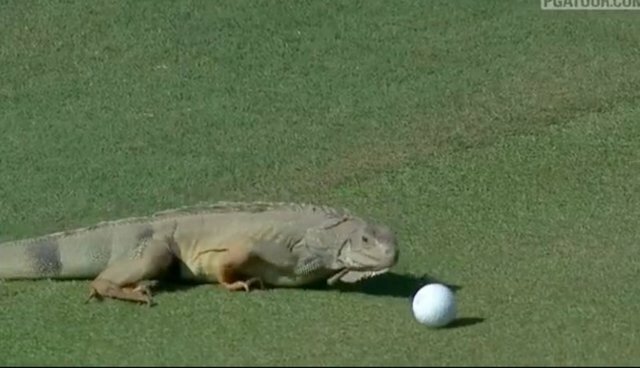 A curious iguana wandered onto the green on the 16th hole at the Puerto Rico Open this week, crawling up to professional golfer Andrew Loupe's ball and pushing it around, perhaps in search of a tasty treat. It's not such a big deal for Loupe, though -- according to the U.S. Golf Association's Rule 18, "if a ball at rest is moved by an outside agency, there is no penalty and the ball must be replaced." The golfer did alright, despite his ball's iguana encounter -- Loupe made par on the 16th hole and tied for 12th at the tournament. As the announcer notes, this isn't the only animal to intrude on a golf game -- in 1998, a seagull picked up Steve Lowery's ball, tried to fly off, dropped it right in a lake.